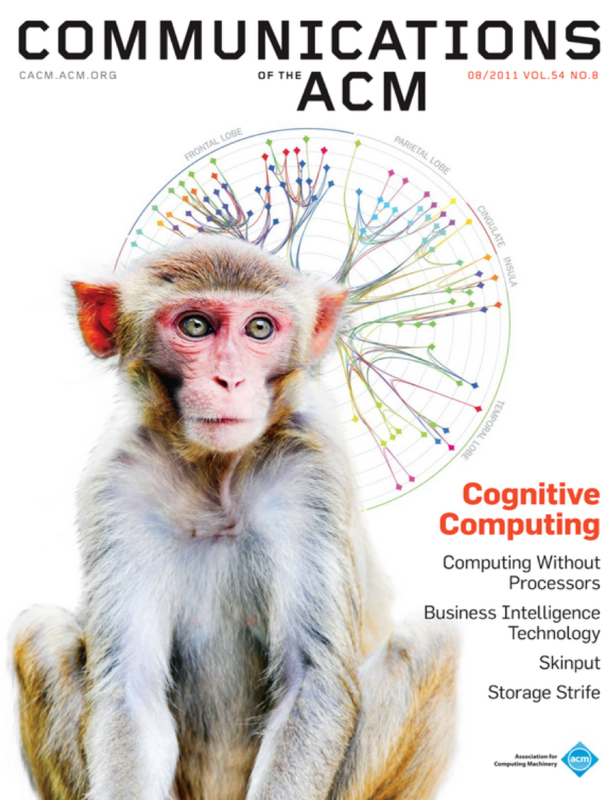 The August 2011 issue of the Communications of the ACM published our paper on Cognitive Computing. Unite neuroscience, supercomputing, and nanotechnology to discover, demonstrate, and deliver the brain’s core algorithms. Today, Lulu Qian, Erik Winfree & Jehoshua Bruck published an interesting paper in Nature. Abstract: The impressive capabilities of the mammalian brain—ranging from perception, pattern recognition and memory formation to decision making and motor activity control—have inspired their re-creation in a wide range of artificial intelligence systems for applications such as face recognition, anomaly detection, medical diagnosis and robotic vehicle control. Yet before neuron-based brains evolved, complex biomolecular circuits provided individual cells with the ‘intelligent’ behaviour required for survival. However, the study of how molecules can ‘think’ has not produced an equal variety of computational models and applications of artificial chemical systems. Although biomolecular systems have been hypothesized to carry out neural-network-like computations in vivo and the synthesis of artificial chemical analogues has been proposed theoretically experimental work has so far fallen short of fully implementing even a single neuron. Here, building on the richness of DNA computing and strand displacement circuitry, we show how molecular systems can exhibit autonomous brain-like behaviours. Using a simple DNA gate architecture that allows experimental scale-up of multilayer digital circuits, we systematically transform arbitrary linear threshold circuits (an artificial neural network model) into DNA strand displacement cascades that function as small neural networks. Our approach even allows us to implement a Hopfield associative memory with four fully connected artificial neurons that, after training in silico, remembers four single-stranded DNA patterns and recalls the most similar one when presented with an incomplete pattern. Our results suggest that DNA strand displacement cascades could be used to endow autonomous chemical systems with the capability of recognizing patterns of molecular events, making decisions and responding to the environment.